Natural earth materials—silica sand, soda ash, lime—are used in making glass. Raw materials are heated to a molten state, then the hot glass is mixed with metallic oxides, which produces the apparent color of the glass. This color appears all the way the through and the product is called “art glass” or “colored sheet glass.” Stained glass is different from art glass, although the terms are often used interchangeably. 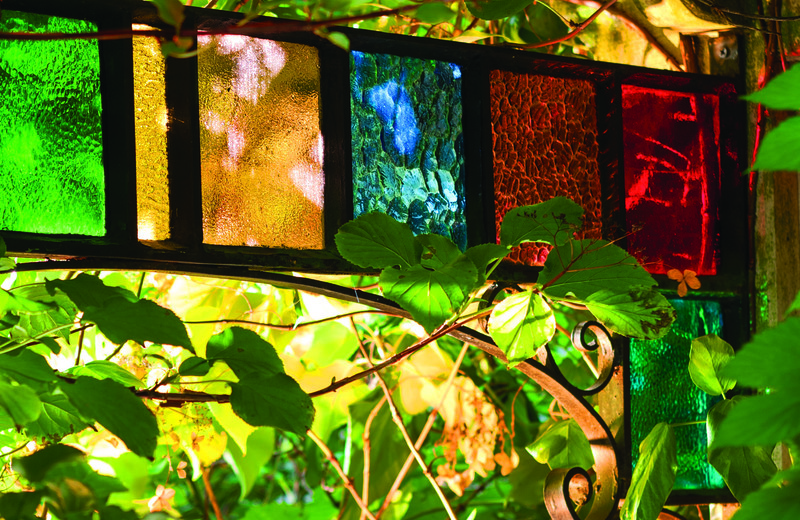 Today’s glass types include stained, colored, painted, etched, and beveled. Glass can also be subtly or deeply textured. So many varieties are available to artisans from companies including Armstrong Glass Co., Blenko, Bullseye Glass, Kokomo Opalescent Glass, Spectrum Glass, Uruboros Glass, Wissmach Art Glass, and Youghiogheny Glass. Antique Glass: Irregular hand-made blown glass, replicating old glass. By the end of the 19th century, new manufacturing methods opened the door to creation of a great variety of glass types: cathedral, opalescent, textured, and iridescent. Art Glass: Imprecise term used in different contexts to mean any use of glass in an artistic manner; or decorative glasswork such as vases; or colored or textured glass used to create windows or panels. Notice the colored art glass in this ca. 1890s bathroom. Bevel Glass: Cold glass (usually clear, thick plate) with edges that have been ground and polished to an angle other than 90 degrees. Transmitted light is refracted and a prism effect results. Bevels are available in a variety of sizes, shapes, and geometric configurations (called “clusters”) for incorporation into leaded-glass work. 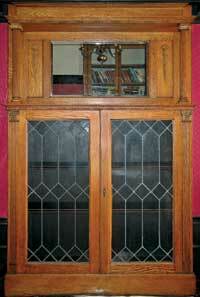 A typical mid 19th-century beveled leaded-glass door panel. 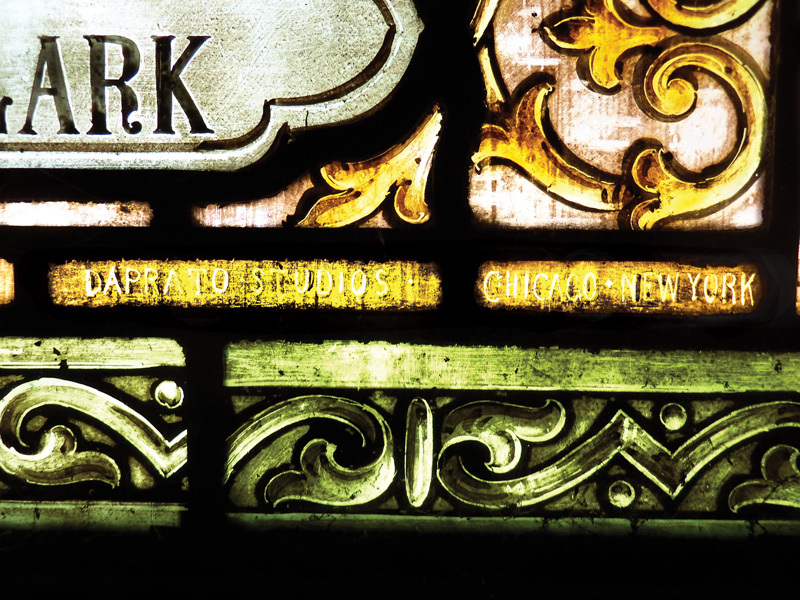 The studio name and location are visible on a corner of this 1890s panel. Came: Channeled strips of lead, zinc, or other metal used to bind glass pieces within a pattern. This framework is structural but also an integral part of the design. Lead or zinc cames hold pieces of glass in place. Cathedral Glass: Describes transparent glass that is monochromatic —e.g., single-color sheet glass—transparent or streaky, with smooth or textured surfaces. Cold Texture Glass: Specialty glasses with a texture introduced on the glass sheet at room temperature; includes glue-chip (frosted), etched, and sandblasted glass. Copper Foil: Thin, narrow strips of adhesive-backed copper tape used to wrap the edges of glass pieces that have been cut to fit a pattern (usually for interior work). Once wrapped, solder is applied. 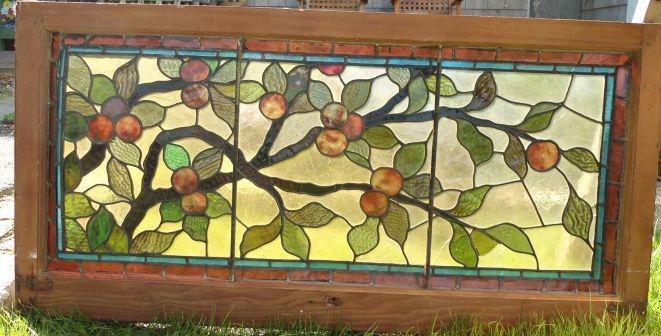 Assembling a stained-glass project in this manner is called the “copper foil technique.” Louis Tiffany is credited with its development. Notice the bulging section, and missing and cracked glass in this 1890s staircase window. Dalles: Thick (Usually 1") slabs of cathedral glass. Dalle de Verre: An art glass medium in which dalles are broken into pieces with a carbon hammer and set in an epoxy base to adhere them in a decorative design. Used in large-scale installations. Frame: The wood, metal, or masonry surrounding and supporting a window panel. Iridescent: Surface treatment in which a layer of metallic oxide is bonded to the hot glass surface just after sheet forming, resulting in a colorful, shimmering effect. Jewel: A piece of glass that has been cut and faceted or press-molded into a geometric shape like a jewel. Often incorporated into leaded-glass artwork. Leaded Glass: Sheet glass pieces joined with metal strips, usually made of lead, called “came.” Solder is applied to the joints of the came to bond the work together. 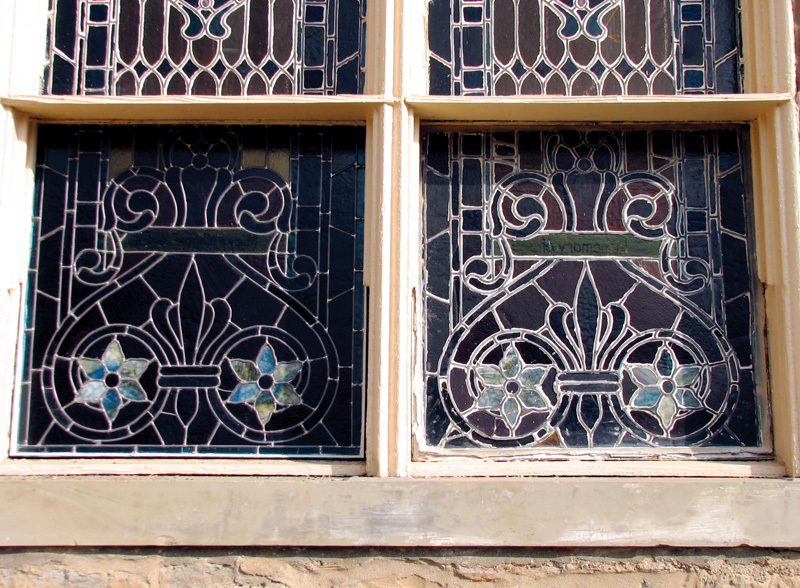 A leaded-glass window is made from small pieces of glass fastened together with lead strips. 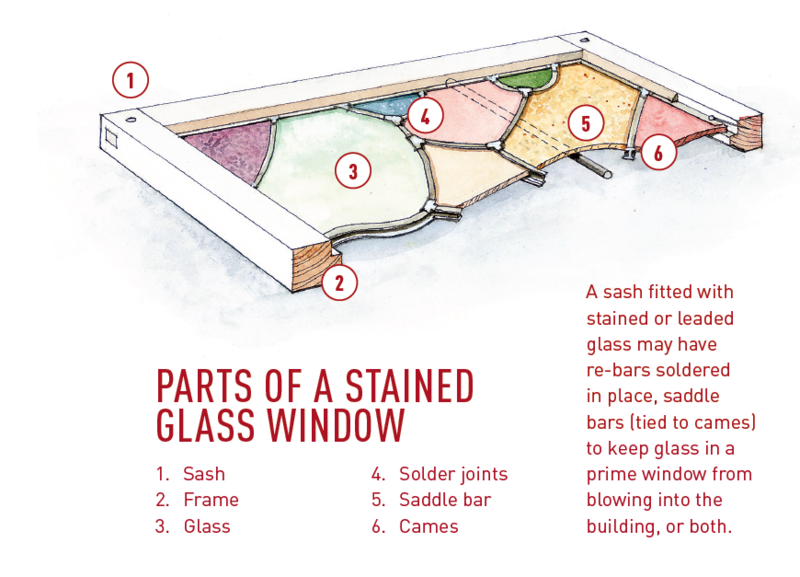 Any kind of glass (clear, colored, beveled) may be held together by lead (or copper, brass, or zinc) channel. Surviving leaded-glass sash in a stairway window. Painted Glass: Glass on which special paints (containing frit—ground glass particles) have been applied in an illustrative or decorative manner and then heated in a kiln to a temperature high enough to fuse the pigments permanently to the glass surface. Medieval stained glass was painted glass. 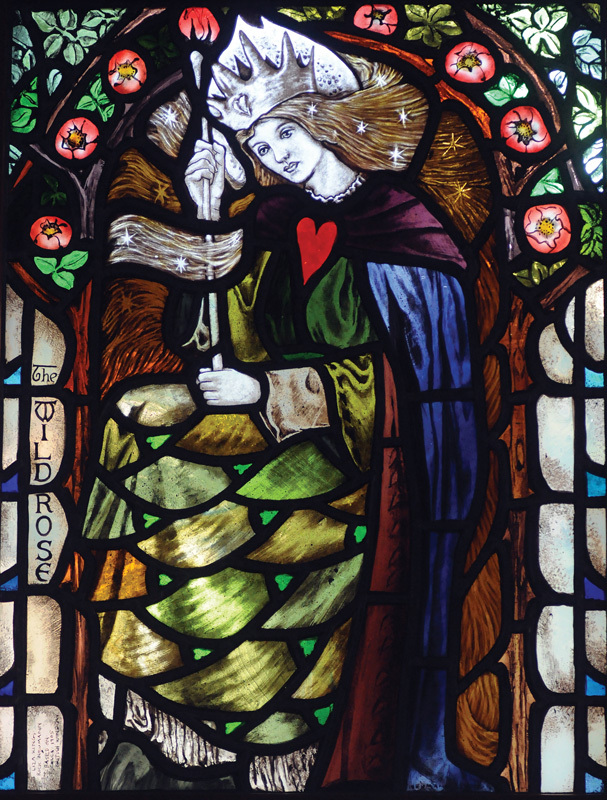 Stained (painted) glass in the old English style, by Neumann Studios. Re-bar: Reinforcement bars, round (saddle) or flat, tied or soldered to the came to stabilize a large panel and keep it from bowing, bending, or sagging. Today hidden re-bar systems are available. Rolled Texture Glass: Specialty glasses created by embossing by the roll as the sheet is formed. Hammered, granite, and muffle glasses, as examples, are textured on one side. Rondel: A mouth-blown piece of glass that has been spun into a circular shape, often irregular. 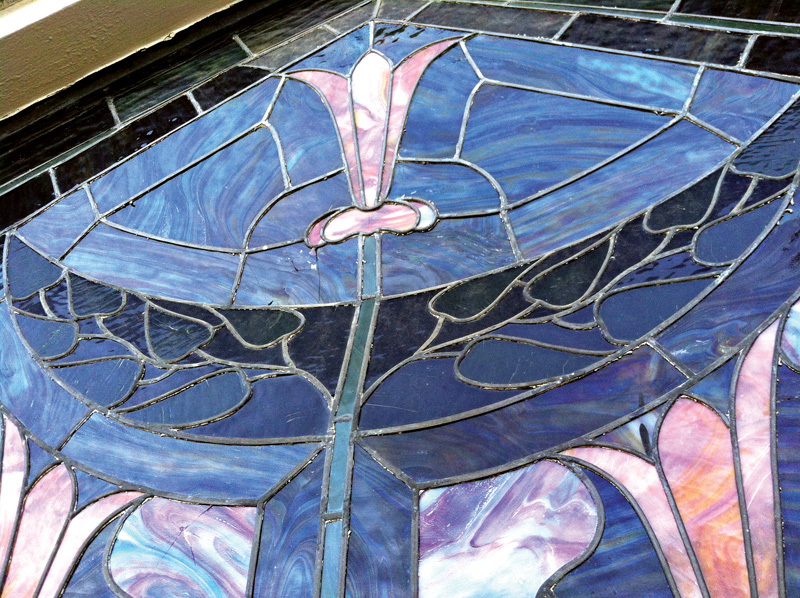 Rondels are sometimes incorporated into leaded-glass artworks. Common, machine-made facsimiles are called pressed rondels. Seedy (Seeded) Glass: Glass in which air bubbles are entrapped; air or a gas is injected into the molten glass prior to forming the sheet. It can range from almost clear to semi-transparent. Solder: A fusible alloy, traditionally tin and lead, used to join metallic parts (as a verb, the act of applying solder). Solder is used to bond metals in both the leaded and copper foil techniques of stained glass work. Newer solders are lead-free and are quick setting. Stained Glass: Once reserved for hand-painted glass, today the term refers to any glass colored or stained (as by fusing metallic oxides into it) for decorative applications (as in windows); also glass that has been colored, enameled, painted, or stained, especially by having pigments baked onto its surface or by having various metallic oxides fused into it; also colored glass used to form pictorial designs, notably for church windows, both by painting and by setting contrasting pieces in a lead framework. Historically and most precisely, the term refers to clear or tinted glass hand-painted with fine glass pigments that “stain” or enamel the surface upon being fired in a kiln. “Stained glass” today refers broadly to the art, the craft, and the industry.